Top class tile Night! Shadow play ftw. @Geci; I'll need some time for my WIP. I hope that's okay? Well I know you won't disappear anywhere as you're a mod, so no worries; but if you want to stick to the rules you could share a very simple line draft. All these time rules are to make sure participants don't forget about their reservations. (for those who wonder, it's within the rules). Good to know for the future. And no problem at all. I really like your WIP. You'll nail it! Very rough WIP for #96. 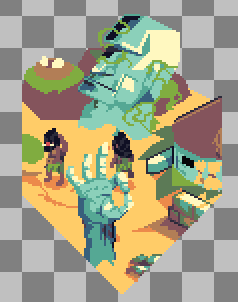 I haven't had as much time to work on my tile as I would have hoped. Here's a WIP for 41 though. Wow, @Finlal is back! Sure, #84 is yours. @darchangel; looks good to me. Alright, everybody. Exactly one (1) month has passed since our own 2018 ISO collab project on PixelJoint had first been launched by our wonderfully amazing Gecimen and our awesome PJ staff, and during just that time alone, ladies and gentlemen, we had successfully produced and completed a grand total of a whopping 46 TILES so far... that is just about halfway home we are already in that, that short a time indeed!!! A most splendid, splendid bravo especially for all of you truly, including by Gecimen, Irenart, Night, jeremy, Reo, Esven, and CuriousBeefJerky as well who did such definitively rather OUTSTANDING tiles that seriously helped make it all possible to the point of quite a sheer record-breaking process of where we are now *and* how far we have come, too. !! Ohhhhh, what a damn glorious, glorious time for all of us to be alive right now, all of you, because if we simply keep up that pace the way we are currently going, we’d have the whole entire 2018 ISO collab map on PJ successfully filled and completed by a precise estimate of THREE (3) MONTHS or less... and at this rate, that thing would be finally done all the way through right before the Christmas Day of 2018 even shows up!!! Wouldn’t that be just spectacular, hmmmm? !!! And let’s not forget: so utterly glad I took part in this resplendent phenomenon of a pixel-art collab project myself by actually chipping in a couple of rather amazing tiles right out of the gate as well, too... including that “Living Prehistoric Tribal Native Tar Goddess” one that richly helped set the scene for the ever-magnificent overall stage to come in terms of me inspiring all you wonderfully superb guys and gals on this entire project for this exact theme that we are currently on indeed!!! Had to do it, too!! Overall then, an ABSOLUTELY MOST BRILLIANT job especially by collectively all of you on making such phenomenal, phenomenal progress that rapidly puts us on the fast track towards getting this whole sumptuously beautiful realm of “PrehISOria” of ours fully 100% finished for the entire pixel-art public worldwide to just see and witness the grandest breathtaking majesty of it all!!! Let’s successfully complete it all before 2019 even begins... and it is QUITE a very real possibility at this point from where we all stand, that is for rather sure!!! !! Couldn't agree more with you Adigun, the collab has broken all records so far, both in terms of time & quantity and quality alike. Btw, why don't you grab another tile yourself? Don't be intimidated, the most challenging tile you pick will hone your pixels skills the most! Hello, can I reserve 14, please? Going to get #91 for some underground city/catacomb stuff. Seems good, perhaps except for the screaming face. So all in all, your tile came out so wonderful indeed as it is so far, with definitely some real excellent pixel-work from you overall on that!! Great work especially on that, and such a pleasure to meet you, Morbidus!!! ! @Esven thank you for the critique! 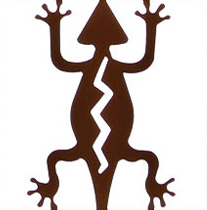 It gave me the idea to try decorating the sloped roof with a native american style lizard symbol, since there were already lizards featured in the tile. It's a challenge to fit it in such a limited space, though. 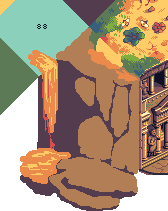 I wanted the person sitting on the edge watching the tile 58 fight to be somewhat of a mysterious woman with very long hair falling over her shoulders, but I've been having a tough time making that read well within the palette. I think she's still a couple pixels smaller than the reference, so I may try to make her a bit bigger. 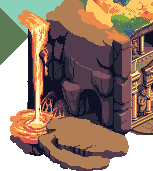 After that, and cleaning up a few details, I think I will call my tile done, unless there is any more critique on it. Of the two latest versions of your tile here, Morbidus, I QUITE like the second (2nd) one a whole lot better; the whites in the eyes of that scared man look a lot more refined, and therefore makes this already great piece much more complete indeed. Excellent job again!! Great tiles notnullnotvoid and Morbidus. Now you got me talking once again into giving this 2018 ISO collab map yet another go, Gecimen, so why not? sorry for my last inactive. but i thought about past wip and reworked it, because building process concept looks bad from behind of pyramide angle. for this new i took what Gecimen offered and add new forest biome for future tiles. Ah! Sorry for falling behind. Will see if I have some time to at least get a WIP going! @Geci: Wow! That tile is just stunning, one of the most impressive tiles we've ever had in my opinion. @Upper0: It's great that you're adding a forest but give your neighbors something to continue! All your trees are still within the borders! throw them some curve balls! Finished tile #15! sorry for the hold up, i've been pretty busy. @Gecimen; Amazing tile, Geci! So detailed and neat. And everybody else. Great progress so far! I had to visualize and combine both Native American and South American wall designs in this one in order to make it my own... and this is clearly the result right here. Notice closely all the details on the ancient patterns and especially that face itself that looks so fierce, brave, and absolutely rather courageous under pressure as you can definitely see in its fullest entirety, all in pure isometric form here. And quite an original I have made that face to be indeed using my own style of pixel art, isn’t it? One look, and you will most easily see why I had to complete that superbly awesome adobe-based home to really put it over the top in such a damn good way, as you can see just above this paragraph here!!! ;) !! Talking of which, ladies and gents, unless there are any criticisms to speak of on Tile #73, I am officially calling this one completed. What do you think of that tile indeed? Thank you all ever so much once again especially, everybody, and I’ve *really* enjoyed creating that newest tile myself for all of you; quite enormous fun!!! !! The wall design indeed looks great! Good work. A few criticism about the tile. In this edit you can also see some antialiasing done to the hard looking lines. Finally one or two people / items / animals sitting or standing around the house would do the tile a lot of good, not to mention give you a sweet challenge of pixel art (and also add to the context of the tile). What do you think? The left person is way too small for our scale, I have to ask you to revisit it. Thanks. I'm doing this too long probably. Trying to make it look at least half decent, i don't know. Any tips? Well the greatest tip exists in your neighbor Jeremy's tile. In general, the thing that will help you is studying the tiles that appeal to you closely and trying to do what they've done. I've done it in the past a lot. Redoing a texture, a person's face, a shape, a from of antialiasing etc. When you don't know what to do, add a light border (to make it light, pick lighter tones where the lightsource comes from). This will especially help both your statues and people. Then check your shapes. For example on the hand statue (which is not bad to begin with), some fingers look misshaped, start changing them 1 pixel at a time (paint a pixel, zoom out and recheck the shape). Don't ever forget shadows. Examine carefully where the light comes from and slightly darken the areas that should not be taking light directly. Shadows are what defines the geometry. Without proper shadows, things will look afloat. For the house/roof texture; again study your neighboring tiles. Reo's tile has a lot of tips there. The head statue will be a harder challenge. The chin needs to be taller vertically and shorter horizontally. Never ever start adding vines or cracks before you finish the main thing. For the nest and eggs, check my tile right below yours. Study it carefully and then it will be easier to do your own thing. After all is done add antialiasing. It's a bit early to tell you how so ask again after you move a little forward. That's so cool, Adigun! I'm glad you put such a vibrant finish on the pueblo. It seems this collab has had less in the way of planned structures/mini-collabs than the last one, but I think that's fitting since these kinds of villages were built in a spontaneous way in the real world too. 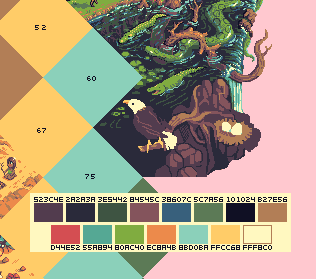 To be honest, I was worried that I might be jumping in way out of my depth joining this collab at first, but it turns out that sharing borders with other tiles is a huge help since it gives you a good starting point, and you can learn from what others have done in their tiles. On that note, may I take a crack at #21? I think I've got a fun idea for it. @notnullnotvoid; I'm glad it grew up on you. Surely, 21 is yours. @zedoff; here is an edit I did to the hand. Again, I absolutely agree with you 100% on everything you said, Gecimen, as literally all of your points on my current tile here are right on the money, so to speak; definitely well said indeed, to be honest!! ...and seeing as this is a prehistoric theme indeed on this year’s entire ISO collab project on PJ, I *just* had to add in a fiercely strong, bold, yet absolutely brave native tribeswoman with a rather sharp fishing spear which also doubles as quite a usefully powerful weapon against the many intruders as she protects that entire splendidly-made adobe house with her loyal husband (as evidently shown from your already most superb Tile #72 that you did such a marvelously brilliant job on from much earlier in this project, Gecimen! ) who is standing side by side with her on different ends of the entire abode itself. They are truly made for each other... even as they DO look out for one another in this ever-dangerous, unpredictable, and rather extensively endless prehistoric realm. “BE ON YOUR GUARD AND ON THE READY! !”, she says to her man there in such fierce yet truly loving fashion, as she cares rather deeply for him with all of her heart, and he for her, as well. By the way, this is the *very* first time I had ever, ever created a pure pixel-art character in isometric form... and yet, I have been having some bad major trouble getting it made period due mainly to the fact that my main computer decided all of a sudden recently to not even start up at all (with absolutely NO initial boot-up beeps whatsoever!!) and had to suffer through restart after restart after restart after random automatic restart, not to mention some nasty abrupt shutdowns while I was in the middle of working under even the most normal of operations... it was just jarringly painful ( !! ), and easily makes me think rather seriously that I am MOST DEFINITELY gonna get a brand-new computer soon. I do not know for sure when that will even happen at all, but when I get enough money to afford me a much better computer, I will truly be back in the running for sure. Until then, in the rare few times nowadays that I did manage to get to get a successful boot and a full start-up, I finally got fortunate enough to richly improve Tile #73 and get it completely finished. Please, do quite bear with me as I go through this horrible bit, as I am likely gonna be out of action on this project for a very long while unless I have a new and better computer indeed. But for now, at least I FINALLY finished Tile #73 at last, and with what is there on offer here on this tile indeed, please enjoy it as handsomely as ever as a wonderful addition to this current 2018 ISO collab map, ladies and gentlemen... it was truly well worth the wait, I most certainly promise!!! !! First of all, notnullnotvoid, thank you especially so much for the outstanding comment on my Tile #73... most awesomely appreciated as deeply as ever!!! !! And second, all of what you just said is ABSOLUTELY true as well, as I can most particularly plain relate to quite all of that there when it majorly comes to such amazing teamwork like this just in order to make a huge pixel-art project here a ton much better. It all takes precise top-notch quality and thoroughly high standards in how phenomenal pixel-by-pixel artistry is made in order to get it all done successfully, overall. You got that exactly right, man!!! And by the way, truly wonderful job and improvements on Tile #65 overall, notnullnotvoid; connects quite beautifully to both my and Gecimen’s tiles in building that splendidly damn magnificent adobe-based home that is just, just PERFECT for this entire prehistoric world that you, I, and all of us are creating in the purest pixel-art form that we alone can all collectively imagine — only we are sure making that rather imagination a total living-and-breathing reality, let’s get all that absolutely correct in rather a much more gorgeously wonderful way, also!! Really enjoyed working with you here!!! !!! @Adigun; this is now a superb tile! The character looks excellent for a first try; I'm really glad I pushed you into this challenge now! Wonderful work.